Emma from Emma Mackley Private Travel got in touch late Monday evening requiring a flyer or postcard for a lunchtime event she was attending on Thursday. I produce lots of marketing material so was happy to help. We settled on a postcard design to reflect the industry Emma works in. The brief I received from Emma was clear and precise which was a massive help, she knew what she wanted on the postcard and sent it all over, I had a PDF proof back to her that night. The artwork was approved early Tuesday morning and sent to the printers who turned the job around in 24 hours. Emma took delivery of her postcards on Wednesday afternoon, in plenty of time for her Thursday lunchtime event! 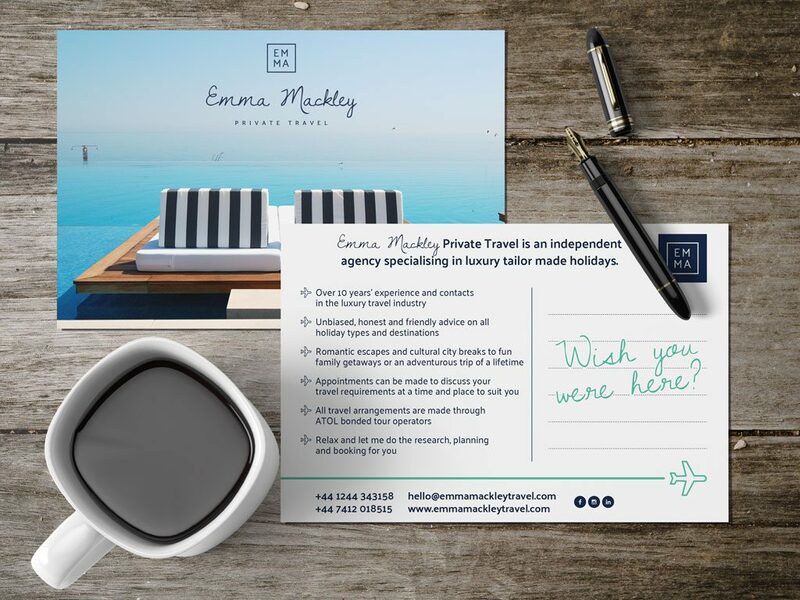 So if you’re looking for an independent bespoke travel agent with over ten years experience in luxury private travel to put together an amazing travel experience – contact Emma Mackley! If you’re looking for a quick turn around on design and print for your marketing material in Chester, then please do get in touch with me!